You won’t find a wider and more affordable selection of quality pottery in South Florida than the one provided by Flamingo Road Nursery. Our garden center is fully stocked with designer planters of all shapes and sizes, including bowls, urns, rectangular contemporary and traditional round pots. From glazed ceramic to terra cotta, mexican talavera and italian clay, our garden center provides unmatched selection and competitive prices. 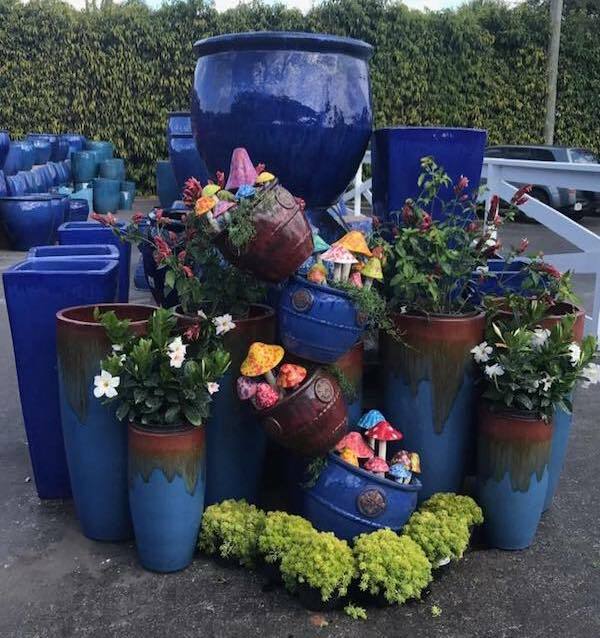 Pottery in the gardenscape has a variety of functional uses and comes in a wide variety of aesthetic styles, so we take pleasure assisting our customers in finding the perfect pot in our 5,000 square foot Pottery Patch. Our staff will also make specific recommendations on the proper potting soil and amendments based on the plant material and location of the pot. And best of all, Free Potting Services are offered to our Garden Club members! Sign up below! Flamingo Road Nursery is a garden center offering pottery & landscaping ceramics, exotic plants, and more to Davie, Plantation, Weston, Sunrise, Miramar, Hollywood, Pembroke Pines, Fort Lauderdale, and surrounding FL communities.